My dear Sir, - Having, in the course of my late duty (of discharging a cargo of meal, &c) at Schull [County Cork], being brought into direct contact with the distress that prevails their and in the neighbourhood, I venture to lay before you (feeling assured it would interest you in their behalf) that which I had ocular demonstration of. In the village of Schull three-fourths of the inhabitants you meet carry the tale of woe in their features and persons, as they are reduced to mere skeletons, the men in particular, all their features wasted away; they have all become beggars. In landing the meal, &c, they used all the cunning they possessed, to avoid detection, in cutting open the mouths of the bags and purloining the contents; and it required great watchfulness to prevent it. Having a great desire to see with mine own eyes some of the misery which was said to exist, Dr. Traill, the rector of Schull, offered to drive me to a portion of his parish. I found there was no need to take me beyond the village to show me the horrors of famine in its worst features. I had read in the papers letters and accounts of the state of things, but I thought that they must be highly coloured to attract sympathy; but there I saw the reality of the whole - no exaggeration, for it does not admit of it - famine exists to a fearful degree, with all its horrors! Fever has sprung up, consequent upon the wretchedness; and swellings of limbs and body, and diarrhoea from the want of nourishment, are everywhere to be found. Dr Traill's parish is 21 miles in extent, containing about 18,000 souls, with not more than half a dozen gentlemen in the whole of it. He drove me about five of six miles; but we commenced our visits before leaving the village, and in no house that I entered was there not to be found the dead or the dying; in particularizing two or three, they may be taken as the picture of the whole - there was no picking or choosing, but we took them as they came. The first which I shall mention was a cabin rather above the ordinary ones in appearance and comfort; in it were three young women and one young man, and three children, all crouched over a fire, and the picture of misery. Dr Traill asked after the father, upon which one of the girls opened a door leading into another cabin, and there were the father and mother in bed, the father the most wretched picture of starvation possible to conceive, a skeleton with life, his power of speech gone! the mother but a little better, her cries for mercy and food were heartrending; it was sheer destitution which had brought them to this. They had been well to do in the world, with their cow and a few sheep, and potatoe ground; their crops failed, and their cattle were stolen, although, anticipating this, they had taken their cow and sheep into the cabin with them every night, but they were stolen in the daytime. The son had worked on the roads, and earned his 8d [pence] per day, but this could not keep the family, and he, from work and insufficiency of food, is laid up, and will soon be as bad as his father. They had nothing to eat in the house, and I could see no hope for any one of them. In another cabin we went into were a mother and her daughter; the daughter emaciated and lying against the wall; the mother naked, upon some straw on the ground, with a rug over her, a most distressing object of misery; she writhed about and bared her limbs in order to show us her state of exhaustion. She had wasted away until nothing but the skin covered the bones; she cannot have survived till this time. Another that I entered had, indeed, the appearance of wretchedness without, but its inside was misery. Dr Traill, on putting his head inside the hole which answered for a door, said 'Well, Phillis, how is your mother today?' he having been with her the day before. She replied, 'Oh, Sir, is it you? Mother is dead!' And there, fearful reality, was the daughter, a skeleton herself, crouched and crying over the lifeless body of her mother, which was on the floor, cramped up as she had died, with her rags and her cloak about her, by the side of a few embers of peat. In the next cabin were three young children belonging to the daughter, whose husband had run away from her, all pictures of death. The poor creature said she did not know what to do with the corpse, she had no means of getting it removed, and she was too exhausted to remove it herself. This cabin was about three miles from the rectory. In another cabin, the door of which was stopped with dung, was a poor woman, whom we had taken by surprise, as she roused up evidently much astonished. She burst into tears upon seeing the doctor, and said she had not been able to sleep since the corpse of the woman had laid in her bed. 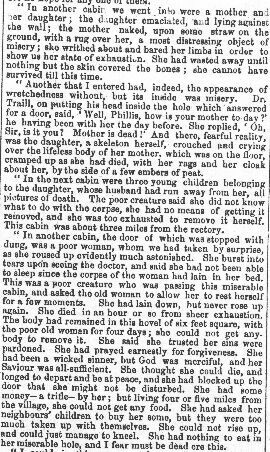 This was poor creature who was passing this miserable cabin, and asked the old woman to allow her to rest herself for a few moments. She had lain down, but never rose up again. She died in an hour or so from sheer exhaustion. The body had remained in this hovel of six feet square, with the poor woman for four days; she could not get anybody to remove it. She said she trusted her sins were pardoned. She had prayed earnestly for forgiveness. She had been a wicked sinner, but God was merciful, and her Saviour was all-sufficient. She thought she could die, and longed to depart and be at peace, and she had blocked up the door that she might not be disturbed. She had some money - a trifle - by her; but living four or five miles from the village, she could not get any food. She had asked her neighbours' children to buy her some, but they were too much taken up with themselves. She could not rise up, and could just manage to kneel. She had nothing to eat in her miserable hole, and I fear must be dead ere this. I could, in this manner, take you through the 30 or more cottages that we visited; but they, without exception, were all alike - the dead and the dying in each; and I could tell you more of the truth of the heart-rending scene, were I to mention the lamentations and bitter cries of each of these poor creatures on the threshold of death. Never in my life have I seen such wholesale misery, nor could I have thought it so complete. I am convinced in that district it is not in human power to stay the evil; it may be to alleviate it: but this must be by a good organized system, and the supply chiefly gratuitous. I am of opinion a number of naval surgeons should be employed, having under their orders a number of men - who might be selected from the lists of pensioners (if they could be highly recommended) - to have charge of certain districts, not only dispensing medicine where it may be required, but also food, on an order of the relief committee, to any person in their district. 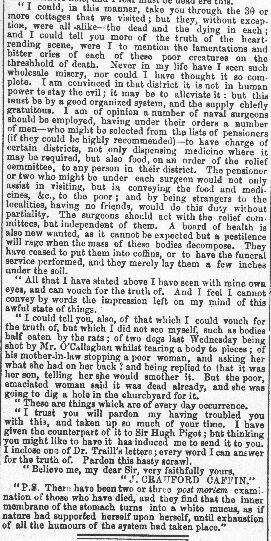 The pensioner or two who might be under each surgeon would not only assist in visiting, but in conveying the food and medicines, &c., to the poor; and by being strangers to the localities, having no friends, would do this duty without partiality. The surgeons should act with the relief committees, but independent of them. A board of health is also new wanted, as it cannot be expected but a pestilence will rage when the mass of these bodies decomposes. They have ceased to put them into coffins, or to have the funeral service performed, and they merely lay them a few inches under the soil. All that I have stated above I have seen with mine own eyes, and can vouch for the truth of. And I feel I cannot convey by words the impression left on my mind of this awful state of things. I could tell you also, of that which I could vouch for the truth of, but which I did not see myself, such as bodies half eaten by the rats; of two dogs late Wednesday being shot by Mr O'Callaghan whilst tearing a body to pieces; of his mother-in-law stopping a poor woman, and asking her what she had on her back? and being replied to that it was her son, telling her she would smother it. But the poor emaciated woman said it was dead anyway, and she was going to dig a hole in the churchyard for it. These are things which are an every day occurrence. I trust you will pardon my having troubled you with this, and taken up so much of your time. I have given the counterpart of it to Sir Hugh Pigot [Commander-in-Chief on the Cork Station]; but thinking you might like to have it has induced me to send it to you. I enclose one of Dr Trill's letters; every word I can answer for the truth of. Pardon this hasty scrawl. P.S. There have been two or three post mortem examinations of those who have died, and they find that the inner membrane of the stomach turns into a white mucus, as if nature had supported herself upon herself, until exhaustion of all the humours of the system has taken place. The signatory is James Crawford Caffin.